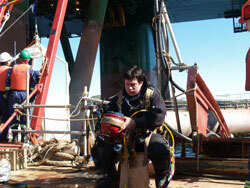 Pro-Dive Marine Services is committed to the provision of a safe working environment for the Company's employees, sub-contractors and others affected by it operations. Safety is a line management responsibility, and supervisory staff at all levels are responsible to conduct operations such that the health, safety and welfare of employees in their care is ensured at all times. Care for the individual needs to be extended to care for the environment, and accordingly, the Company's operations will be conducted to minimize ecological damages to the environment so far as it reasonably practical. Wherever possible, materials used in support of the Company's business shall be those which present the least risk to the health of personnel and the ecology of the environment, at the same time adequately and safety fulfilling the needs of the tasks being performed. It is this safety-orientated philosophy that has prompted us to register our Safety Management Systems with both the Newfoundland and Labrador Construction Safety Association and the Nova Scotia Construction Safety Association. 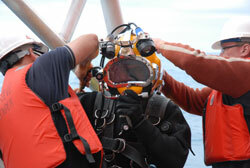 Pro-Dive Marine Services was formed with the primary goal of providing the highest quality ROV, diving and subsea services to its oil and gas industry customers. With the emergence of the east-coast oil and gas industry, Pro-Dive recognized the need to be internationally certified with respect to its Quality Management System. Pro-Dive Marine Services has had an ISO 9002 Quality Management System registered with Quasar Quality System since 1997. The Quality Management System has been successfully audited and re-registered under the ISO 9001:2008 international standard. 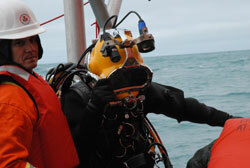 Pro-Dive conducts its business in accordance with this established system; this confirms Pro-Dive's commitment to quality and its commitment to becoming Atlantic Canada's premier subsea services provider. Pro-Dive Marine Services is a member of the International Marine Contractors Association (IMCA) in both the diving and ROV categories.